Countertop Ventless Deep Fryers | Chill Masters, Inc.
Operation Modes: Rapid Fry Mode – automatically begins cooking the next batch. Preset/Preset Locked Modes – Pre-program up to nine different food items into the electronics system. Manual Mode – Operates as easy as a microwave! Advanced Electronic Capabilities: Cook Time Sensitivity (CTS) – Ensures a consistent product by automatically extending cook times to account for significant drops in temperature. Preset Counters – Monitor the amounts of up to nine different food products that have been cooked in the PFA Rapid Fryer. Food Type Sensitivity (FTS) – Control the movement of the basket to ensure that all products are dispensed at the conclusion of the cooking cycle. Stand-By Mode – Reduces power requirements during non-peak periods. 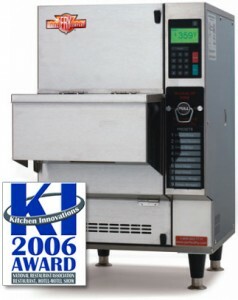 Dual Load Cook Cycle – Cooks two products with two different cook times simultaneously to reduce preparation time. Hold Time Monitor – Monitors the elapsed hold time of finished products following a cooking cycle. Self-Venting: Vents or hoods are not required which means huge cost savings as a conventional hood and vent system can cost between $5,000 and $20,000! Hood and vent systems require a lot of maintenance and upkeep. The cost to run this system for a year will offset the initial cost. Virtually Odorless: All Perfect Fry models use patented HEPA-style air filtration technology. The air is drawn up through the front grill over the oil vat and into the grease filter, removing the larger grease particulate. The remaining grease-laden air travels through the HEPA style replaceable air filter cartridge, removing the remaining particulate. The activated carbon eliminates any odors. During EPA 202 air emissions testing, results showed the filter allowed only 0.039 mg/m3 of effluent into the air. That’s well below the 5 mg/m3 limit. Safety Features: Integral fire suppression with automatic and manual actuation. Safety interlocks prevent the fryer from being operated improperly. Tested and listed using the latest standards. Compact Design: Perfect Fryers have the largest product output with the smallest footprint of any countertop deep fryer available today! Measuring only 17″x16″ at the base, it takes up less than 2 square feet of counter space and eliminates the need for costly renovations. Easy To Clean: No other countertop deep fryer is easier to clean thereby saving you time and money. All the internal components can be removed in under a minute. Components are individually removable for easy cleaning. Weekly cleaning can be done in under an hour.